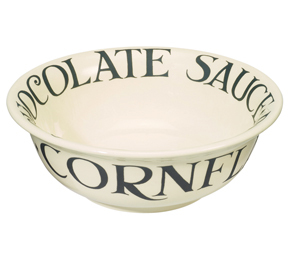 Although the Black Toast French Bowl is the original, we know you just love the Black Toast Cereal Bowl. And it fits perfectly into the dishwasher. 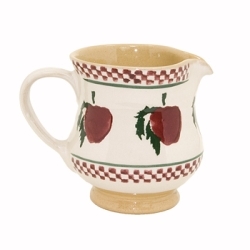 All Emma Bridgewater pottery is made from cream colored earthenware ñ a traditional Staffordshire product which they make in their own factory in Stoke-on-Trent, the home of British pottery. Most of the production work is still done by hand, and all the pieces are individually hand-decorated, so every one is very slightly different ñ and their sponge ware is always signed by the person who painted it. Dishwasher and microwave safe. Lower temperature wash and gentle detergent recommended to maintain appearance. Pottery is not oven safe unless marked as cookware. 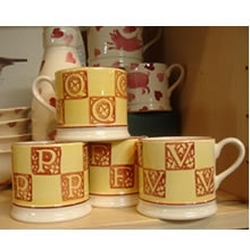 Yellow and Brown Letter Baby Mug "V"